The June run and campout was held at McIver State Park, at Estacada, Oregon. We got the big group site, which was 'huge'! It could have held a hundred people, so we were lost in it vastness. The site being very private, was like having our own isolated forest camp. Nice. 16 of us were able to make it for this run. The weather was 'mommy bear' in the middle... not too hot, not too cold. Lots of rabbits and squirrels running about made things interesting. Some of us gathered for dinner just down the road for Friday night at the River View, a happening motorcycle hangout. Breakfast the next day saw us a a mom and pop place in Estacada, which took forever to get food out to us, so it was a good thing that not many were on that menu run. Dinner saw pizzas flying into camp so we can hang out more at this beautiful site. Firewood was delivered by Dave, who lives locally, so we enjoyed a nice evening around it under the trees Saturday Night. Sunday came quickly, and we packed up early so that many could head out to ride for the first time in a long time in the Portland Pride Parade. The guys lining it up for the group shot warm-up. Darryl in full formal leather dress. Look'n sharp! Lots of good cheer in getting together again on this very nice weekend. Mike's V65 gave up the ghost somewhere along the way. Dennis road all the way back to Washington to get his trailer. Attempts to repair at camp were not successful as an electrical component failed. BRMC guys stick together. New arrivals at the park, catching up on all things. Member Alan H contacted media person Crystal Ligori several months ago about possibly doing a feature story about the club. Since that original contact Crystal began working for Oregon Public Broadcasting (OPB) and pitched the story idea to her boss. Long story short, Jeff B was interviewed by Kate Davidson just before the Portland Pride Parade. Jeff did a great job representing the club! Afterward, Jeff said, "Crystal, it seems the interview was the 'talk therapy' we both needed to get off the fence and onto bikes!" After the interview Jeff went out and got a new battery for his bike and rode in the Pride Parade. Jeff hadn't been on his bike for two years since his accident at the last Enterprise, OR run. Crystal said that she was going to get her motorcycle endorsement. Below is a link to the OPB website where the printed story can be found as well as the audio recording. 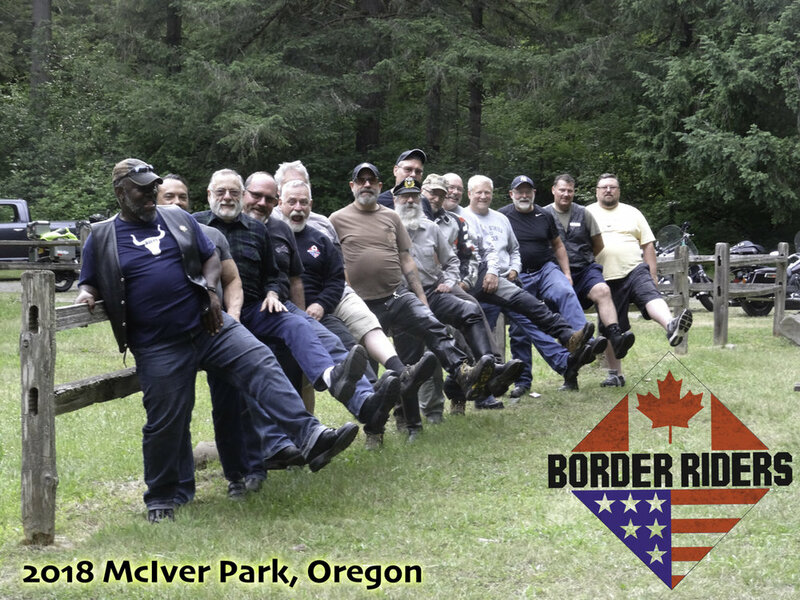 https://www.opb.org/news/article/border-riders-motorcycle-club-portland-pride/ The recording is also currently on the homepage of the club website. 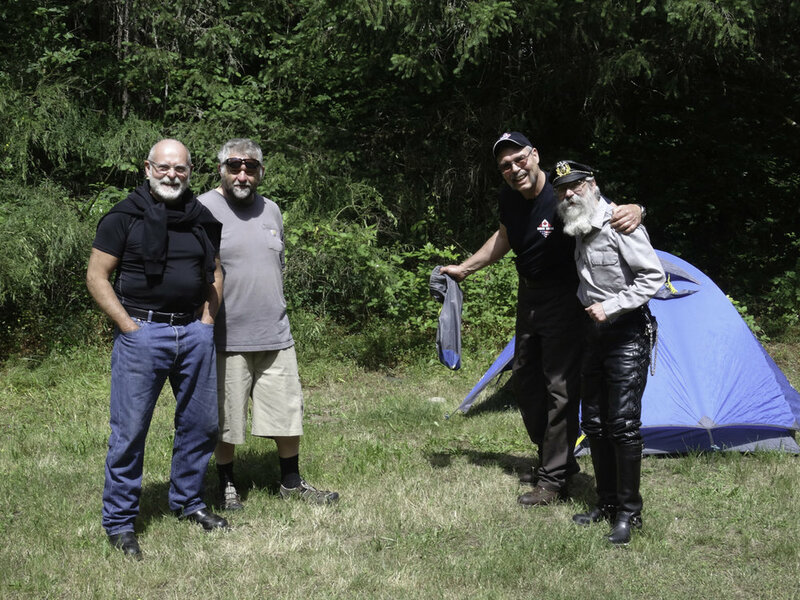 From left to right, Guest Don A., Jeff C, Richard A, Marc L.
The organizers of the Seattle St Jude's Rock n Roll Marathon asked the Border Riders Motorcycle to assist with the race on June 10th. There were over 17,000 runners that participated in the 5K, Half Marathon and the full Marathon. We were asked to provide rides for members of the media. Marc L., Richard A. and his brother Don, and myself volunteered to help out. I met Richard at 4:45 a.m. at the 300th St Park & Ride and then caught up to Don at the Everett I-5 rest stop. We arrived at our designated meeting point at the start of the race at 6:00 a.m. where Marc was awaiting our arrival. The race began at 6:30. Marc had the official photographer as a passenger and I had the videographer. The other two media people did not show up so Richard and Don went to breakfast and headed home. Every few minutes a group of runners would be released and after several groups had left the starting point we headed out on the motorcycles. We followed the runners on the route. It was a challenge to ride with the runners and stay on the route. There were two very steep hills that were a challenge to navigate up slowly with a pack of runners surrounding the bike. At various points along the route they had bands playing. The bands varied from Rock N Roll to Japanese drummers to country music. There were full bands as well as just individuals performing. The race began and ended at the Seattle Center. On the lawn area of Seattle Center they had a large stage set up with bands playing throughout the afternoon. The Marathon followed the same route as the Half Marathon for the first first half and shortly before the finish line the Full Marathon veered off for the second half of its route. We only completed the Half Marathon. I can now saw that I have completed a half marathon......okay maybe it was on a motorcycle! I am looking forward to the run this month over at Kettle Falls. It will be an opportunity to explore an area that I haven't been to as well as ride some roads I haven't been on. I plan to head out Friday morning and go over Hwy 20. I always enjoy the scenery of riding over the North Cascades Hwy. I hope to see you in Kettle Falls. The second event is to have a bigger and better Anniversary Banquet. The Anniversary Banquet will be held in Seattle in 2020 and we would like to get as many current and former members there as possible. The June run to Milo McIver in Oregon was slightly different than most. We had a very spacious campground, but it was very underused. The bulk of the Washingtonians didn’t make it to the campground on Friday due to a delay with problems with Michael’s bike. He stayed at a hotel with his bike and others stayed at another hotel further on. I went back to Seattle to get trailer for Michael’s bike as didn’t figure he would be able to get it fixed on Saturday. We had other offers of help from the Portland area and it feels great to have a group that really looks out for each other. The other thing is given the proximity to Portland we had a few that commuted to the campground rather than staying. Then on Sunday off to breakfast and the ride in the Portland Pride Parade. Because of the previous events I didn’t ride in the parade, but the Facebook posts looks like everyone had fun in spite of slow riding and heat on the air-cooled bikes. Riding in Portland’s parade raises some questions for future planning. I’ll be sending out an email to members shortly asking about riding in future parades. Some of the things to ponder are: Is it something we want to do in the future? Do we want to rotate between Vancouver, Seattle and Portland even if it involved changing the camp weekend? I will have the list of questions out in the next week and would appreciate response tally before the July run so can discuss at the meeting. I hope to see many of you at the runs throughout the summer, get out and ride. The trip to Kettle Falls will be a long haul for most riders, but well worth it. Unlike many parts of Eastern Washington which are flat and boring there are many great opportunities for day rides in the area. We’ll be staying at Evans Group Camp 11 miles north of town. Kettle Falls is not a large city, but definitely larger and more offerings than Fossil. Bring your passport or Nexus as a northern day ride would take you into Canada. Evans Group Camp is along the northern shoreline of Lake Roosevelt. The site is long and narrow, an orientation that allows for a fantastic, clear view of the lake from every vantage point. Lake Roosevelt is a 130-mile lake on the Columbia River created by the Grand Coulee Dam. Evans provides ample shade with thick forests of ponderosa pine, douglas fir and maple trees. The lake area is abundant with wildlife, including moose, elk and deer. Quite a few bald eagles have been spotted around Evans. Much of the water in the originates from glaciers and snow in the cold, high Canadian Rockies, though temperatures are pleasant to swim in during summer. Beach fires are permitted year-round on the exposed lake bed, EXCEPT when the fire danger rating for the park is at or below Level 2 as indicated by the Washington State Department of Natural Resources for the area, Because of being right on the lake chances are better for a campfire than many areas, so we'll have to see as we get closer. Cost is for the campout is $25 for members, $35 for guests, Canadian prices adjusted per the standing order. Watch your emails for registration opening and reminders to register. We have 11 members with birthdays this month. Please take a moment to wish them a great day.